Hurricane Sandy caused unprecedented damage across some of the most densely populated coastal areas of the northeastern United States. The costly, landscape-altering destruction left in the wake of this storm is a stark reminder of our Nation’s need to become more resilient as we inevitably face future coastal hazards. As our Nation recovers from this devastating natural disaster, it is clear that accurate scientific information is essential as we seek to identify and develop strategies to address trends in coastal landscape change and reduce our future vulnerability to major storm events. 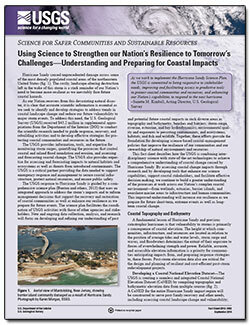 To address this need, the U.S. Geological Survey (USGS) received $43.2 million in supplemental appropriations from the Department of the Interior (DOI) to conduct the scientific research needed to guide response, recovery, and rebuilding activities and to develop effective strategies for protecting coastal communities and resources in the future. This fact sheet describes how the USGS is combining interdisciplinary science with state-of-the-art technologies to achieve a comprehensive understanding of coastal change caused by Hurricane Sandy. By assessing coastal change impacts through research and by developing tools that enhance our science capabilities, support coastal stakeholders, and facilitate effective decision making, we continue to build a greater understanding of the processes at work across our Nation’s complex coastal environment—from wetlands, estuaries, barrier islands, and nearshore marine areas to infrastructure and human communities. This improved understanding will increase our resilience as we prepare for future short-term, extreme events as well as long-term coastal change. Simmons, D.L., Andersen, M.E., Dean, T.A., Focazio, M.J., Fulton, J.W., Haines, J.W., Mason, R.R., Jr., Tihansky, A.B., and Young, J.A., 2014, Using science to strengthen our Nation’s resilience to tomorrow’s challenges—Understanding and preparing for coastal impacts: U.S. Geological Survey Fact Sheet 2014–3062, 6 p., https://dx.doi.org/10.3133/fs20143062.